This post was going to be a comment on the hackernews discussion, but I figured I would make it a blog post since I think it’s a thought worth writing down. Large portions of what we think we know is iterating, because it is relatively young. 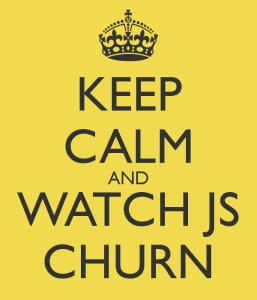 I say keep calm and watch it churn. Experienced/smart/lazy (read: good) developers will find the combination of frameworks and libraries that produce the most desirable balance of trade-offs, and they will stick with it. Things will change around them, as they always do, and that good developer must decide, as any craftsman must, when to change and when to hold fast. Something will rise from the noise, and when it does, it will be worth it.